The inheritors of the future will not be the e-Retailing upstarts of the late 1990s. They will be today’s visionary traditional retailers, who apply online business technique to establish new and higher standards for customer care atop their already formidable branding and merchandising foundations. Stores will never become extinct. But make no mistake. In a few short years, all retailing will be e-Retailing. 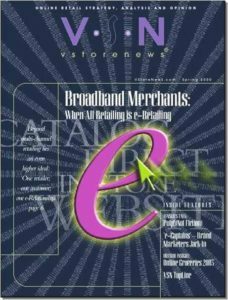 Just this one glossy edition of VStoreNews was ever published, due mainly to changing business conditions. It and the downloads available here exemplify VSN's mission to spread cogent analysis of an extraordinarily dynamic business transformation at the peak of the dot-com retail phenomenon. Take Your Web Portal And Stick It! Holiday Sales: Will Vstores Lead or Follow? Will Amazon.com Soon Be the Internet of Wal-Mart? - Keith Yagnik, VP Relationship Management Solutions, Nexgenix, Inc.